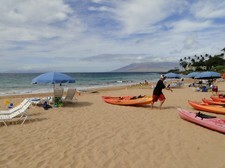 Wailea Beach was named "America's Best Beach" in 1999 by the famous "Dr. Beach." Feeling the perfectly fine white sand underfoot, and seeing the gorgeous stretch of sun-soaked sand stretching before me, I could see why. With such perfect sand, and breathtaking views of the neighbouring islands of Kaho'olawe, Molokini and Lanai, Wailea Beach is yet another one of the best Maui beaches for sure. We enjoyed a few hours of swimming, playing in the surf, and building a sand "hot tub" for our boys to splash in. As is typical for these beaches, in the morning the wind is generally calm, but it can get rather strong in the afternoons. With the wind comes some fun waves to splash in though, and we definitely made the most of that! This beach is bordered by the Wailea Beach Villas condominiums to the north, the decadent Grand Wailea Resort around the back, then the elegant Four Seasons to the south, along with the Wailea Point condominiums. 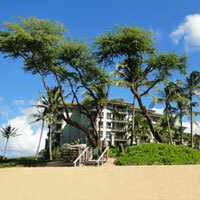 With upscale properties such as these, the landscaping around the beach is lush and full of tropical beauty. There is lots of free parking available in the beach parking lot. As you walk from the lot to the beach, you'll pass the public restrooms, a picnic area and showers. 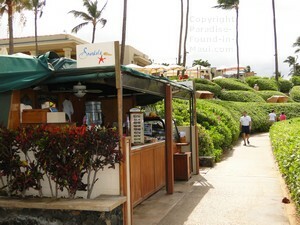 If you find yourself hungry, the most convenient place to grab a bite to eat is a kiosk by the name of "Snorkels." Other options include packing your own snacks as we did or ordering take-out from the resort restaurants. Snorkels is a perfect spot to grab a bite to eat since it's so conveniently located on the paved walkway in front of the Four Seasons Resort. They sell breakfast starting at $2.25 for their pastries, $4.75 for their bagels and $10 for a fruit plate. Lunch options include a really nice assortment of sandwiches and wraps priced at $9.50 apiece or Crudite for $8. Snacks (including ice cream and snow cones) and beverages were also available for sale. In addition to good eats, they also sell handy items such as sunglasses, sunscreen, snorkels and other gear. When the wind is calm (most likely in the early morning), the snorkeling can be good near the rocky points at either end of the beach. 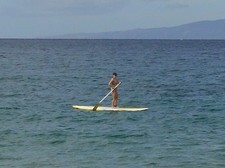 Other fun activities include swimming, boogie boarding, stand-up paddleboarding and kayaking. There are no lifeguards at this beach, so you'll have to use your own best judgment on which activities are suitable for you. We drove from South Kihei to Wailea Alanui Drive. If you're heading south along this road as we were, you'll pass the turn-off for Ulua/Mokapu Beach on your right, then the Shops of Wailea, Wailea Ike Drive and the Wailea Beach Villas. 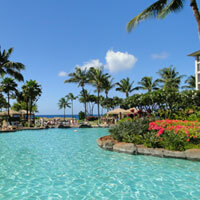 Finally, you'll see the Grand Wailea on your right - you're almost here! You'll see the Ho'olei condominiums on your left, and just after that is the turn-off for the Wailea Beach public parking. 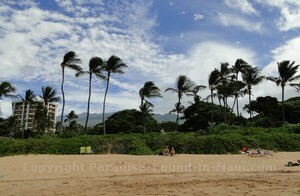 If you're staying in Kihei, this beach is only a 5 minute drive from the south end of town. And if you're already in Wailea, you'll be even closer than that! 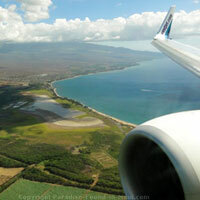 Read about things to do and where to Stay in Wailea, Maui.